The screens are crisp and clear with no marks or scratches, there may be very minor marks on the external surround casing. With a 9” swivel screen that folds flat into a tablet. No other accessories supplied. This P ortable Video Player is incredible! The swivel screen ( 270 ° rotation and 180 ° flip) that it can lay flat like a tablet, you can adjust the screen easily without having to move the player to a different location. Read disc format: DVD-RW, VCD, DVD, CD, EVD, MPEG4, CD-R/RW, Super VCD, mp3-cd. Lithium battery capacity: 1800mAh lithium battery (built-in). With TV and radio function (need to connect closed-channel antenna, or cable TV antenna can be used). Play your movies and music in your car! Setting up a portable player has never been easier. This is a manufacturer refurbished product. Simply plug in and mount the screens on the headrests in your car. BUSH 10" PINK PORTABLE DVD PLAYER WITH REMOTE AND LEAD CDVD100W1SWMP SWIVELS! HERE WE HAVE A BUSH PINK SWIVEL SCREEN 10" PORTABLE DVD PLAYER. WITH WALL LEAD. FULL WORKING ORDER WITH REMOTE. This Sylvania Portable DVD player boasts a super large 11.6" crystal clear LCD Screen! Sylvania is the Worlds #1 Leader in Portable DVD Players and this unit leaves nothing out. USB and MMC/SD Card Reader Built in to Watch Digital Movies/Videos/Images. Compatible Disc Formats: DVD, EVD,CD,VCD,DVD, CD-RW,DVD-R,DVD-RW. Wireless search depends on local signals. SD/MMC/MS three-in-one card reader, high-speed USB computer interaction. Super DVD function, fully support DVD angle. 270 degree rotary display: free rotation and multi-angle appreciation. The wireless search station depends on the local signal. TF/MMC/MS three-in-one card reader, high-speed USB computer interaction. 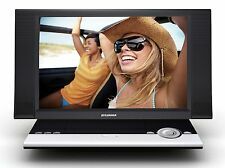 Excelvan Portable DVD Player With 10. Battery: 5000mAh Li-battery. Do you think a long trip by car must be a bore?. That is so outdated! With Excelvan portable DVD player, get rid of boredom while trip from now on. Sony NP-FX110 Battery Pack for Sony DVP-FX Series. Excellent pre-owned condition. No visible wear. The direction of the screen can rotate 270 degrees, adjust viewing angle. -LCD Liquid crystal display. The characters of this DVD player Can set 4:3 or 16:9 screen of video output, suitable for different TV screen. Now you can watch movies on the go with the QFX PD-109 9" Portable DVD Player. The QFX PD-109 9" Portable DVD Player features a 9" TFT LCD swirl display with a USB port. Also The built-in lithium-ion battery can play for up to two hours per charge, making the QFX PD-109 9" Portable DVD Player suitable for keeping you entertained while you are on the go. This 9" DVD Player is compatible with the following formats: DVD, CD, VCD, SVCD, MPEG, MPEG2, JPEG, WMA, MP3 and MP4. The black TFT LCD DVD Player supports AV in and out and comes with earphones, AV cables and a remote control. Philips PD9016 37 9-inch LCD Dual Screen DVD Player-KEEPS KIDS HAPPY IN THE CAR! DVD, DVD /-R, DVD /-RW, (S)VCD, and CD ?. all of them can play on the DVD player. Likewise, DVD /-RW handles both common rewritable disc types. You can enjoy your favorite music in great sound without disturbing others by connecting your headphones to this device. Portable DVD player by Logik. DVD player is 25cm x 18cm x 3cm with a 10" screen. PAT tested for electrical safety. Item has been tested with a DVD and appears to be in good working order. 10, Include headrest mount case for In-car use, r emovable Design. 3, Built MTK chip, the most stable chip ever used on Portable DVD player. 5, Built-in USB/SD/MMC card read port, s upports 720 576 resolution AVI video playback and mp3 and jpg format. Enterprise Networking & Server. Car /Motorcycle Vehicle part. TV function: With cable TV signal interface, hundreds of channels can be preset. Can easily receive cable TV channels (only support analog TV, do not support digital TV). Original case w/ strap. The screen is in very good condition. Pink Curtis Portable DVD player with screen 7"
7" Portable DVD Player. See photos. 1x 10" Logik 12v Car Dvd player. These are ex-display units in very good condition. The screens are crisp and clear with no marks or scratches, there may be very minor marks on the external surround casing. AV socket. Swivel LCD screen screentFT LCD screen. Shock resistant. DVD region 2. Operated via car socket (cable included). Brightness 120cd/m². 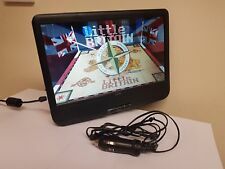 Used portable DVD player in good working condition. Includes case, ac and car adapter. Unsure of how long it last, but I listened to a full 45 minute CD twice with power still left after. Feel free to ask! Musical theater devotees, sports fanatics, and music connoisseurs alike appreciate the electronics and capabilities of this Sony portable DVD player. Sony DVP-FX720 Portable DVD Player (7". Type Portable DVD Player. ). The portable dvd player and mains adaptor only does not include the remote or any in car accessories. Playback compatibility: DVD, DVD-R/RW, DVD R/RW MP3. Single screen. Contrast ratio 450:1. Power Consumption: 15W. 1 x DVD Player. Support Format: DVD R/W, DVD-R/W, DVD, CD-R, CD-RW, VCD, SVCD, PHOTO-CD, JPEG, MP3, MP4. 1 x AV Cable. 1 x Power Cable. 1 x Antenna Cable. Power Cable Input: AC 100-240V, 50/60Hz, 0.4A Max. 2 USB ports. 2 channel audio output. DVD region 2. Operated via car socket (cable included). The full function remote is nice and easy to use even the youngsters can use it on their own, so you can enjoy a smooth ride with no nagging and no complaints. Ideal for kids to share or for use in small rooms, plus the screen swivels for your viewing convenience. Swivel screenTFT LCD screen. MASSIVE 12" HD SCREEN. DVD region 2. Operated via car socket (cable not included).